I loved a recent blog on 4C’s blog for new parents, Put a Bib on it, “My Emotional Intelligence Could Use Some Work.” I think it contains an applicable lesson for child care providers as well as parents. Jillian is a first time mother who is going through the discoveries of infancy and toddlerhood right along with her child. 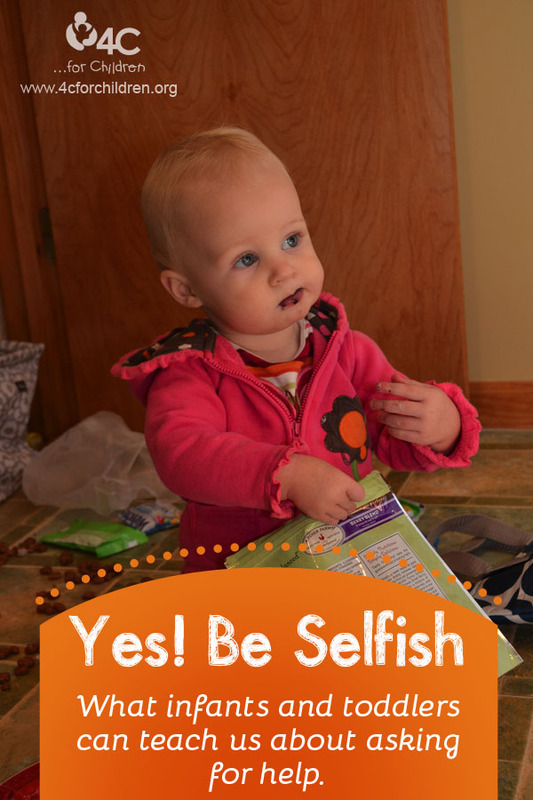 In this blog she talks about her child being selfish. Yes, toddlers are selfish. But toddlers have an honest selfishness. Selfishness for toddlers is a survival mechanism. Toddlers are still learning how to get their needs met. Actually, I would argue some toddlers are still learning what their needs are. As an adult, I’m still learning what my needs are, too. Young children do not have the vocabulary yet to explain exactly what they need or what they are feeling. Emotions may also be a foreign concept to young children. Goodness, even getting hungry and thirsty correct may be a challenge for children. So this selfish concept is a survival mechanism for young children. Grabbing the toy may be an unacceptable behavior, but it’s what the child knows to do to get needs met. Throwing the cup may not be what you want to see, but it’s what the child knows to do to say she is done with her cup. Saying your name over and over again is not something that adults like to hear, but it’s what the child knows to do to get our attention. Is all this “selfish”? I would contend no. Merriam-Webster defines selfish as : “having or showing concern only for yourself and not for the needs or feelings of other people.” Young children are learning that other people may not like what they like. They are learning that other people are in fact, other people. Some of us have hidden guilt that prohibits us from getting our needs met. Maybe you feel selfish asking for help in your classroom when you are overwhelmed with work, but it’s okay to ask for help. I was recently diagnosed with breast cancer, and the outpouring of kindness from friends has been amazing. As an adult who is used to taking care of my own needs, it’s been hard accepting help. It’s been hard accepting meals. It’s been really hard admitting when I can’t do something. I feel selfish. I’m not suggesting that adults need to yank people’s glasses off or throw cups. I am suggesting that adults learn from how young children learn to ask for help. Whoever would have thought that young children would teach us how to be successful adults? This entry was posted in Best Practice, Early Childhood, Infants and Toddlers, teachers and tagged ask for help, child care providers, selfishness on September 19, 2013 by Christine Fields.